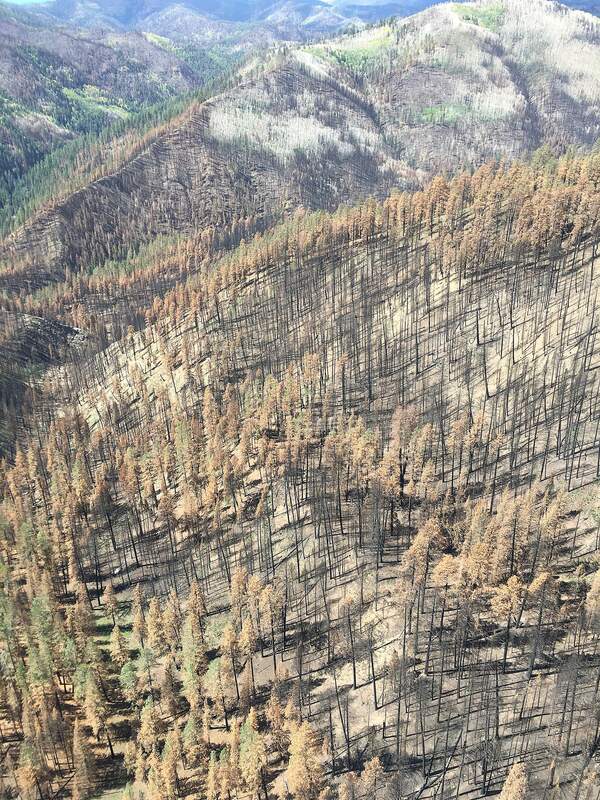 The 416 Fire burned intensely in the Hermosa Creek drainage. Foresters say the blaze burned two of five champion trees in the drainage. A Douglas fir and blue spruce near the confluence of Hermosa and Dutch creeks burned during the height of the fire. This Douglas fir, which burned in the 416 Fire, was named the “Outfitter Tree” because Animas Valley rancher Sandy Young had a camp at the base of the tree. 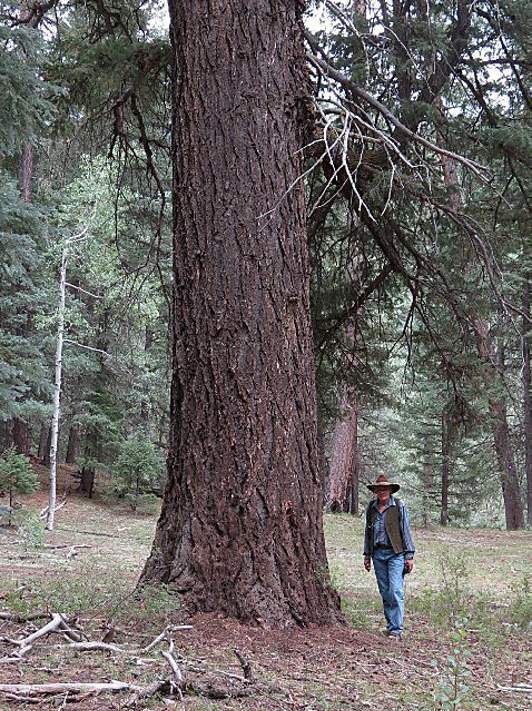 This champion ponderosa pine in the Hermosa Creek drainage, standing at 148-feet tall with a 12-foot circumference, survived the 416 Fire. Two of the largest trees in the state of Colorado fell victim to the flames of the 416 Fire, a flyover of the burn scar revealed last week. Since the outbreak of the 416 Fire in June, forest researchers have wondered whether the record-setting trees in the Hermosa Creek drainage survived, said Gretchen Fitzgerald, a forester for the U.S. Forest Service. “We had some hope,” Fitzgerald said Tuesday. 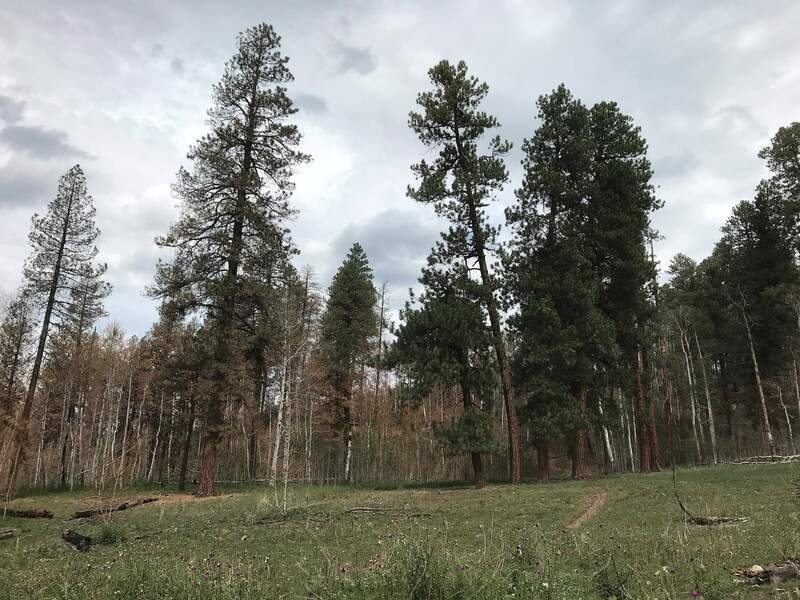 The Hermosa Creek drainage, about 20 miles north of Durango, is considered a prime spot for big trees to grow because of the combination of fertile soil, moist air and protection from severe weather patterns, Fitzgerald said. In recent years, the state of Colorado has identified five “champion trees” in the Hermosa Creek valley. Champion trees are ranked on a point system, taking into account the tree’s height and circumference, among other factors. In Hermosa Creek, one Douglas fir and two blue spruce trees were ranked No. 1 on the list in their respective categories. A ponderosa pine and a southwestern white pine held the No. 2 ranking for their species, according to state records. On Sept. 6, Allen McCaw, a forest engineer with the U.S. Forest Service, said a flyover of the burn scar confirmed the Douglas fir and one of the blue spruce trees, located in Dutch Creek flats, burned in the 416 Fire. The foresters held out hope the burned Douglas fir and blue spruce, located in an open meadow near each other, would escape the fire’s flames. But the area near the confluence of Hermosa and Dutch creeks burned during the height of the fire. The 416 Fire broke out June 1 and went on to become one of Colorado’s largest wildfires in state history, burning more than 54,000 acres, mostly on the San Juan National Forest in the Hermosa Creek drainage. In 2013, Sandy Young, a rancher in the Animas Valley who recently died, nominated this Douglas fir in the Hermosa Creek drainage for champion tree status. The tree, 163-feet tall and 17 feet in circumference, burned in the 416 Fire. It was one of the largest trees in the state. The Douglas fir stood 163-feet tall and 17 feet in circumference – making it one of the largest trees in the state. It was nominated in 2013 by Sandy Young, a rancher in the Animas Valley who recently died. The Douglas fir was named the “Outfitter Tree” because Young had a camp at the base of the tree, Fitzgerald said. The blue spruce was listed as a champion tree in 2014, standing at 166-feet tall with a circumference of about 12 feet. Despite its size, Fitzgerald said blue spruce are not very fire-tolerant trees. On the other hand, there is some good news: The other three champion trees did survive. Fitzgerald said forest managers hiked up Hermosa Creek on Aug. 31 and found that the ponderosa pine, southwestern white pine and the other listed blue spruce tree had been spared the 416 Fire’s deadly flames. 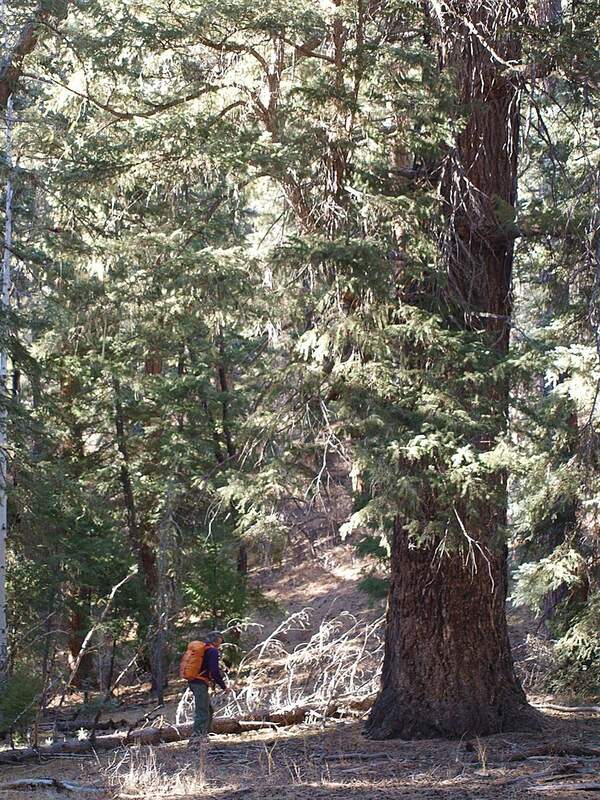 The 181-foot-tall blue spruce is located near the Hermosa Creek trailhead. The fire burned all around the area, but the tree, which has a circumference of about 11 feet, is located in a sheltered valley. 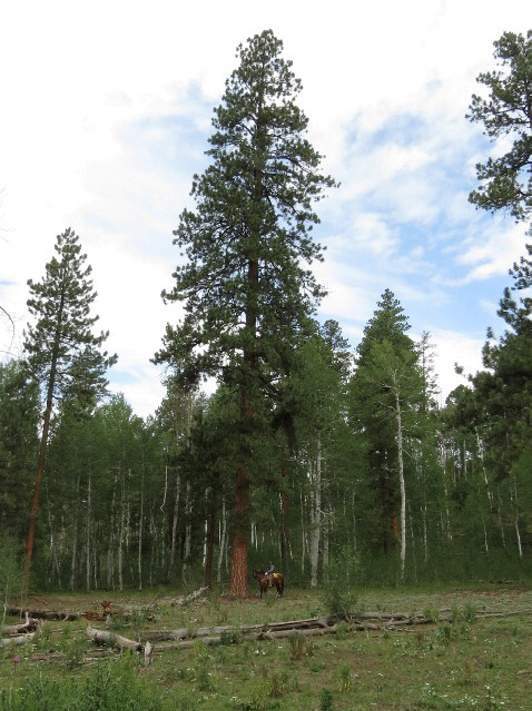 This champion ponderosa pine in the Hermosa Creek drainage, standing at 148-feet tall with a 12-foot circumference, survived the 416 Fire likely because it’s located in an open grassland. The ponderosa pine, standing at 148-feet tall with a 12-foot circumference, survived likely because it’s located in an open grassland and there were no fuels around it to burn and get hot enough to take down the tree, Fitzgerald said. “It’s a beautiful, old-growth tree,” she said. And, the southwestern white pine, which is actually a hybrid unique to Southwest Colorado, also survived the 416 Fire. The tree is 109-feet tall and has a circumference of about 9 feet. “I was excited to see those other trees made it,” Fitzgerald said. Mark Loveall with the Colorado State Forest Service, which partners with the Colorado Tree Coalition on the Champion Tree Program, said the agency will independently verify what trees survived once access to Hermosa Creek opens. In areas where the 416 Fire didn’t burn at high intensity, Fitzgerald said there are already signs of vegetation coming back. For the Forest Service’s McCaw, the burning of Hermosa Creek elicits complicated emotions. On the one hand, his family has run cattle in Hermosa Creek for the past 100 years, and he’s grown attached to the towering trees and the lush green vistas. On the other hand, he’s a forest manager, and knows the vital role fire plays on the landscape.